1. To make the graham crackers: sift together both flours, salt, and cinnamon into a medium-sized bowl and set aside. 2. In the bowl of a stand mixer fitted with a paddle attachment, combine the 2/3 cup butter, brown sugar, and honey and beat until fluffy, about 5 minutes. Add the sifted dry ingredients to the butter mixture in three additions, beating until just combined after each addition. Wrap the dough tightly in plastic wrap and refrigerate for at least 30 minutes before rolling, or for up to two days. 3. Preheat the oven to 350 degrees F. Line a baking sheet with parchment paper. Once the dough has cooled, roll it out to 1/4-inch thickness on a lightly floured work surface. Cut out the graham crackers using a 3 1/4-inch round cookie cutter and arrange them on the prepared baking sheet, placing each about 1/2 inch apart. Bake the cookies until they are golden brown, about 12 to 15 minutes. Remove the cookies from the oven and transfer them to a wire rack to cool completely. 4. To make the crust, place 12 of the baked and cooled graham crackers in a food processor and pulse at 5-second intervals until fine crumbs form. Transfer the crumbs to a separate bowl and combine them with the melted butter. Press the crumbs into an even layer in the bottom of a 9-inch springform pan. Bake the crust until dark golden brown and firm, about 10 to 12 minutes. Remove from the oven and allow the crust to cool completely. 5. To make the filling: in a small saucepan, bring the raisins and Marsala or port to a boil. Remove the pan from the heat, cover, and set aside for about one hour. In a large bowl, mix together the ricotta, sugar, and cream until well combined. Stir in the eggs one at a time. 6. Crush the aniseed or fennel seed in a mortar and pestle or seal them inside a plastic bag and crush them with a rolling pin. Add the crushed seeds to the ricotta mixture and stir to combine. Stir in the raisins and any unabsorbed liquid, along with the flour, vanilla, and orange zest. Scrape the mixture into the prepared springform pan and bake the cake until it feels barely firm and the top is golden brown, about one hour. Remove the cake from the oven and let it cool completely. 7. Run a knife around the sides of the cake to help loosen it from the pan and release the sides of the springform. 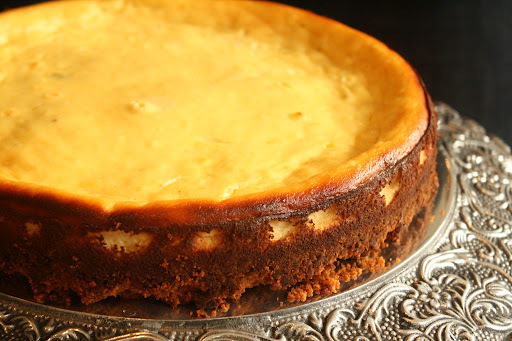 As David Lebovitz describes it in his book, “American cheescake is to Italian cheesecake what slouching around the house in a sweatshirt and jeans is to stepping out on the town in a tailored Armani suit.” Unlike classic New York cheesecake, this Italian rendition uses airy ricotta versus dense cream cheese and sour cream. The filling contains notes of refined flavors such as orange zest, golden raisins, aniseed and a splash of vanilla extract that ties them all together. When I first viewed the recipe, I loved the idea of a leaner, more sophisticated cheesecake but still wanted to maintain one aspect of the traditional American version we know and love: the graham cracker crust. With that in mind, I set off to make some spectacular homemade graham crackers to match the quality of the filling. You can skip this step and substitute store-bought cookies, but I highly encourage you to take the long route as the crust is really what elevates this cake to the next level. And on a related side note, the graham crackers are fabulous on their own: buttery, crisp, and sprinkled with cinnamon. As expected, the final product was a hit with all of my dinner party guests. 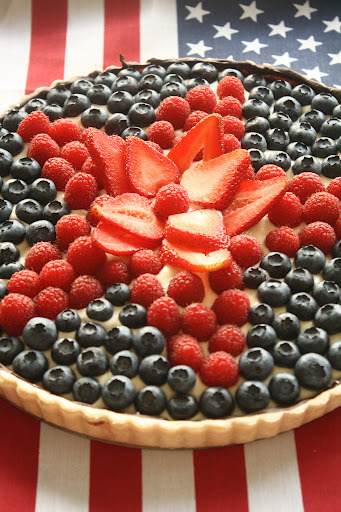 After a filling summer barbecue, everyone appreciated the lightness and subtle sweetness of the dessert. The only adaptation I might make next time around is to puree the golden raisins after they have been infused with the Marsala wine to achieve a smoother consistency. Proof serves a small selection of European-style sandwiches made with the bakery’s signature Stecca bread. From left: salami, manchego, and chive butter, beet, arugula, and goat cheese, and ham with heirloom tomatoes, gruyere, and grainy mustard. I have a confession to make. There is this awesome, authentic French bakery tucked into a charming corner of Los Angeles that I have been frequenting for the past year. It’s called Proof and every day, the young, talented staff produces small batches of flaky pastries, thin European sandwiches, and refined desserts. All this time has passed that I have been munching on petite paris-brests and salted caramel tarts and I haven’t told you all about this bakery yet. Well, today is the day, my lovely readers, that you too will learn of this hidden gem of a patisserie. I first discovered Proof 18 months ago when I interviewed the owner and creator, Na Young Ma, for an article in my student newspaper. Na Young is an alumnae of my high school and a firm believer in hand-crafted baked goods sourced from the highest quality, seasonal ingredients available. 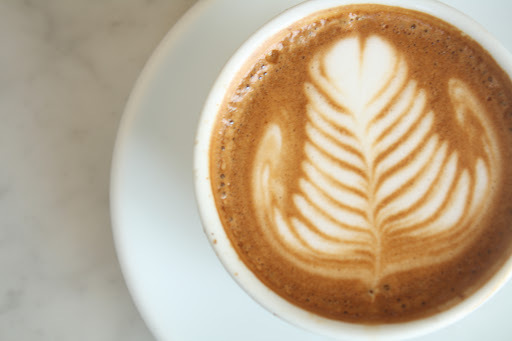 She purchases fresh fruits and vegetables every week from local farmers’ markets and serves artisan coffee from one of L.A.’s finest roasters: Cognoscenti Coffee. You cannot go wrong with any item on the menu, but some of my favorites include the Valrhona Chocolate Chip Cookie, the Almond Frangipane Shortcake with seasonal fruits and whipped cream, the Yogurt Cheesecake, and the Flourless Chocolate Torte. On the savory side: I adore the sandwiches, especially the Heirloom Tomato with Double Cream Brie and Basil. Sandwich offerings change daily and tend to sell out quickly, so I recommend arriving right at noon for an early lunch. 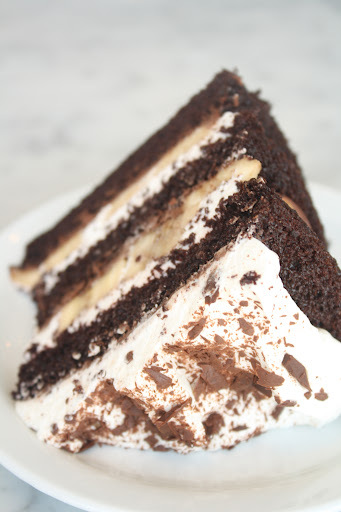 One of the limited-time selections at Proof includes this Devil’s food cake layered with milk chocolate ganache, whipped cream, and caramelized bananas. Walking into Proof is like entering a cozy bakery on a side street of Paris except with a hip, SoCal influence. The interior contains tiny marble tables and wobbly bistro chairs and a blackboard displays the menu options, hand-written in chalk. The front staff are pleasant and always willing to answer questions. The bakery is located on Glendale Blvd., in an up-and-coming neighborhood of Los Angeles called Atwater Village. The street hosts a handful of cute stores along with a famers’ market every Sunday, ideal for browsing on a lazy afternoon. Oh, and one more thing, just in case you aren’t convinced yet. The granola is incredible- the only one I eat. It has ended my search for the perfect granola and has inspired me to replicate the recipe on my own. Tuesday-Sunday, 8 a.m. – 4 p.m.
1. Preheat the oven to 350 degrees. Line a 12-cup muffin tin with paper liners. 2. Spread the wheat bran evenly on a baking sheet and toast in the oven for six to eight minutes, stirring a few times to ensure the bran cooks evenly. Allow to cool completely. While the bran is toasting, heat the raisins with 1/2 cup water in a small saucepan. Simmer for 10 minutes, or until the raisins have absorbed all the water. Puree the plumped raisins in a small food processor until smooth. 3. In a large bowl, mix together the cooled bran, buttermilk or yogurt, and additional one cup water. Mix in the raisin puree, orange zest, and brown sugar. Once these ingredients are thoroughly combined, add the oil, egg, and egg white. Sift the flours, baking powder, baking soda, and salt directly into the wet ingredients and stir until just combined. At this moment, you may add an additional 1/2 cup raisins or other dried fruit of your preference into the batter. 4. Spoon the batter into the muffin tins, making sure the batter is mounded slightly on each one. Bake for 25 to 30 minutes, or until the muffins feel set in the center. Since I started my blog two years ago, I have become a better baker, traveled to new, exciting destinations, and gained experience as a writer. While I am pleased by how this site has grown from the day I first launched, I still grappled, until recently, with one crucial aspect of blogging: photography. I felt as though the camera controlled me, its various buttons and features overwhelming me every time I attempted to snap a shot. That was until I attended my first natural light food photography workshop, taught by Christina Peters and Amy Paliwoda of MDR Photography in Los Angeles. The seven-hour course covered the fundamentals of photography and food styling, everything from white balance and aperture to product placement and color stories. I learned invaluable information about my camera and how to manipulate technical settings and light in order to achieve the ideal shot. It was also a pleasure to interact with the other bloggers and foodies who participated in the class. I left the studio with newfound knowledge and confidence in my photography abilities and the contact information of some of the lovely people I met. Now, let’s talk muffins. I bookmarked this recipe a while ago then promptly shifted my attention to more vibrant items in my queue. However, when my mom requested a good bran muffin last week, I knew exactly where to turn. 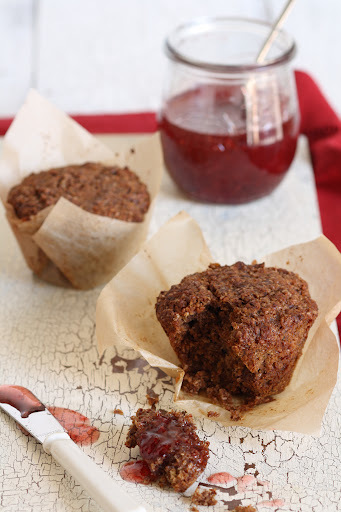 These bran muffins are lighter and airier than any other version I have tried. There is plenty of hearty bran flavor packed into each bite and the raisin puree provides a tone of earthy sweetness without adding sugar. Paired with some fresh fruit and yogurt, this is a breakfast pastry you can feel good about. It allows you to start your day energized and satisfied, unlike the guilt you endure after indulging in a buttery cheese danish. 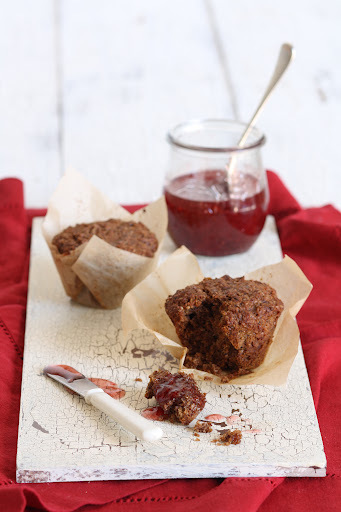 These bran muffins have definitely claimed a spot in my prestigious list of go-to recipes, holding their own among NY Times chocolate chunk cookies and French macarons.